Recently I went detecting to an old field on the outskirts of the village. A long time ago, there had been a trading place on this field, where horses were sold. 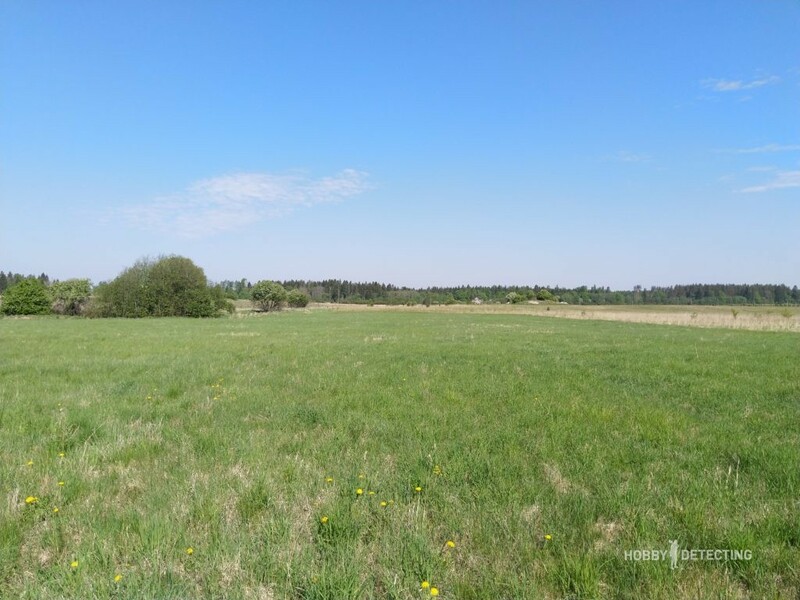 Just imagine it: a large field, summer, heat, and many horses. Everyone walking in the street, trading, business as usual. This was a good place for that kind of business – all roads go through this place, you can leave and enter this place from all four directions. Crossing roads has always been a priority for detecting places. In addition, the old church was close by. In such a place, you must always go detecting. It is better to dig everywhere on such a field – then you will have a complete picture of the place. I went back to this place again this year again, but this time with my Deus and the 9” HF (high frequency) coil. Now to G.B. settings: Tracking, expert: no notch, ground sensitivity: 5. As for ground balancing, a small tip: it is better to reduce the sensitivity of the soil in trashy areas, because if you put a high level (6+), the metal detector starts to believe that the finds in the ground are actually the changed level of soil mineralization, and it will possibly create interference. With a low tracking value, the XP Deus quietly runs in trashy areas at a pre-set G.B. level and does not load its processor with unnecessary processes. This field turned out to be very interesting. Most likely, there was a small house on the hill, which is very close to the field, and later it was plowed all over the field. This one can assume because of the number of forged nails everywhere, mixed with various other debris with traces of burning, which leads to the thought that the house was burned down. Next to the field, there was a park, just across the road. I will also detect this park, but later, when the grass is not so tall. There must be many finds there! One of the first more or less readable finds was a Shilling from the times of King Eric XIV of Sweden. 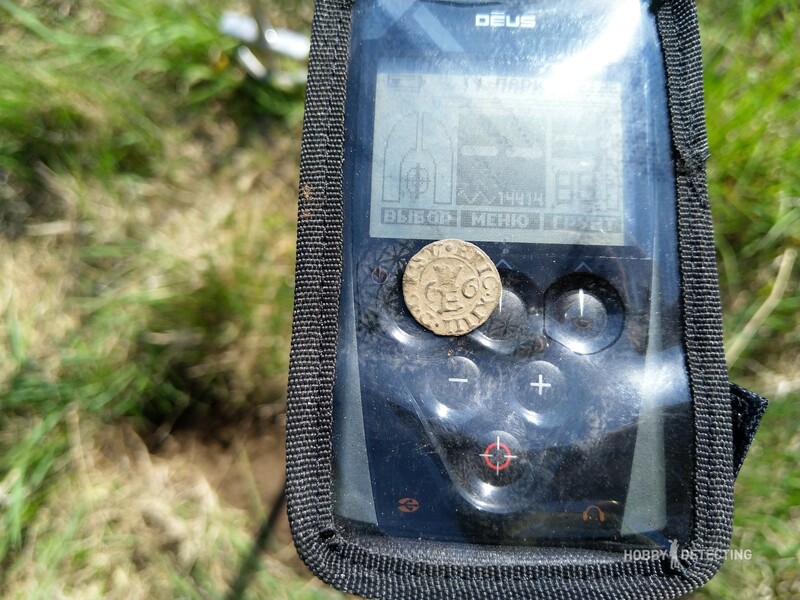 A small and thin coin, slightly larger than the buttons on the Deus. This coin was deep and the signal was weak so I had to dig a little. The depth was about 15-17 cm. At first, it was difficult to determine the coin, but then I quickly figured out what it was. 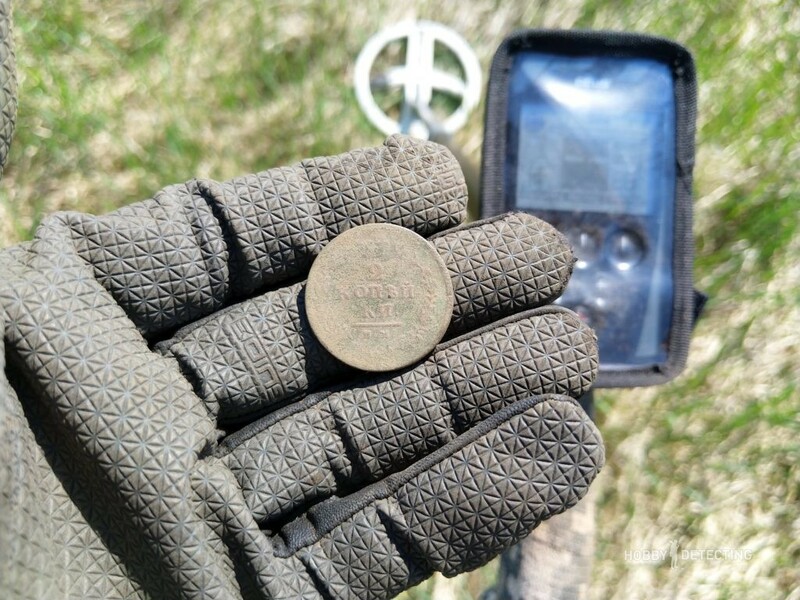 After a couple of hours of more digging of iron debris and various small finds, such as a bell and a button, a common visitor emerged – 2 Kopecks from 1812, from the times of Alexander the First. It almost seems like these coins were scattered everywhere in the fields. 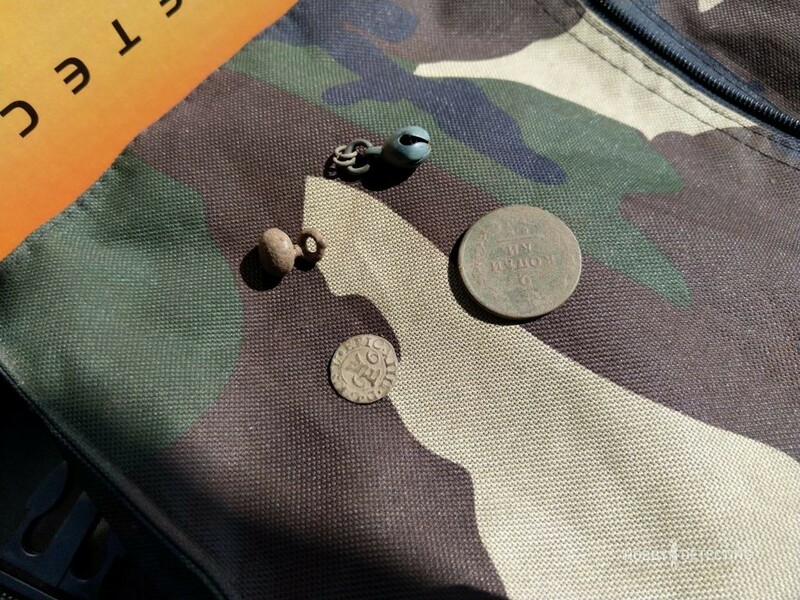 Moreover, a short summary of the three-hour running around the field – 2 coins, bells, and an old button. This is not a lot, but considering that forged nails are everywhere in this fields, it is definitely something! The grass was still high, but a small white 9” coil 9 could fit between the heaps of grass, but still, there is nothing better than a plowed field! Other settings and tips for the Deus, I will continue to publish. This is a very advanced metal detector, and with it, you can quite universally adjust to almost any detecting conditions, which we will gradually do.